It is shaping up to be the largest show of union strength in decades. SIPTU's call for a national day of protest on Friday in support of Irish Ferries' workers has galvanised the Irish Trade Union Movement. Activists across the country are striving to ensure the highest possible turnout for the demonstration in Dublin and a number of other towns in Ireland. 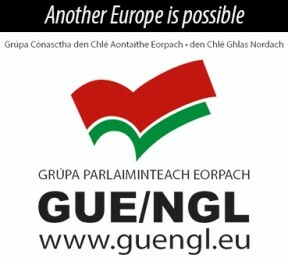 Commitments to mobilise supporters are flooding in from a host of unions and organisations including the Communications Workers' Union, still involved in its own industrial dispute, the Civil and Public Service Union and the National Bus and Rail Union. The teachers' unions have also committed their support and the Building and Allied Trades Union, BATU, will ensure the presence of large numbers of construction workers. British trade unions have added their support, as their predecessors did to the ITGWU during the 1913 Lockout with a demonstration at Holyhead on Wednesday. Speaking to An Phoblacht ahead of the protest, Norrie McVicar of the International Transport Workers' Federation said: "There is a high awareness and a great deal of support for the Irish Ferries' workers in all the unions across the British TUC. This demonstration is about making a protest against the company and showing solidarity with the workers on the vessels. It is only a beginning." Even the Catholic hierarchy has weighed in behind the workers with a commission of Irish bishops saying: "Irish Ferries is a profitable company and the desire to maximise return on capital employed ought not be pursued at the expense of the workers employed and in a manner that could undermine societal acceptance of appropriate standards of employment and rates of pay. 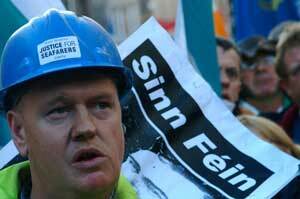 "The march has taken on a life of its own," SIPTU Branch Secretary Mick Corcoran told An Phoblacht. "There has been a tremendous show of support from the workers and the people alike and people coming into our office her to let us know they're backing the workers." On Tuesday, Sinn Féin Dáil Leader Caoimhghín Ó Caoláin asked the Taoiseach if now would "be an appropriate time for the government to consider a buy-out of Irish Ferries, to ensure that it is in state control and that we can guarantee the uninterrupted continuation of the essential supports that this economy requires as an exporting country?" While Ahern refused to reply, Sinn Féin spokesperson on workers' rights Arthur Morgan TD kept up the pressure later in the day asking Minister Mícheál Martin. "Would the Minister accept that what Irish Ferries is doing is trying to bring us back to the 19th Century? In the 19th Century workers had to fight hard to achieve an eight-hour day. That was achieved by the 20th Century in most states in Europe and in North America. Irish Ferries is trying to bring us back to a situation where the 12-hour day is the norm. We should work towards a competitive economy, not the one some exploitative employers are currently trying to achieve." As An Phoblacht goes to print the two sides are in the Labour Relations Commission discussing recommendations drawn up by the National Implementation Board (NIB). While the proposals represent substantial progress on a range of issues, union members are not optimistic. "We were not hopeful going into these negotiations to be honest," said Mick Corcoran. "The negotiators themselves are not hopeful of reaching an acceptable solution to the problem at this time." The NIB's proposals and the willingness of management to consider them suggests the unions have the company on the back foot but a mass mobilisation of workers on Friday can only strengthen the hand of both union negotiators, and the progressive left in Ireland.